Incredible Value! Brand new 1697 sq ft 3 bed 2 bath Rancher on crawl in French Creek, at Sanika Place. This home boasts a great room concept with beautiful vaulted ceilings, stunning hardwood flooring, granite counter tops and natural gas fireplace. The kitchen has a walk-in pantry, pendant lighting over eating island, beautiful cabinets with European stainless hardware. The master suite is endowed with large ensuite with dual sinks, dual shower heads and large his and hers walk-in closets. This huge lot boasts RV Parking complete with oversize double garage, (with storage/ work area), heat pump, low E energy star windows, fiberglass shingle roof, hardi-plank exterior. Location, location adjacent to new development of Wembley Mall shopping area, ice arena, restaurants & walk to schools, ocean, French Creek harbour. 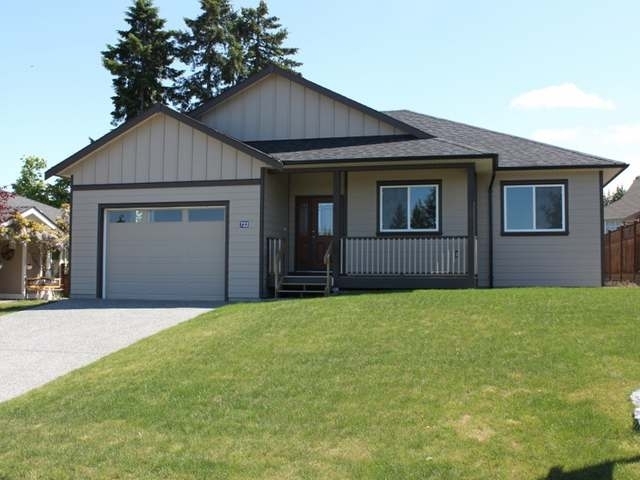 Close to Golf courses and all amenities of both Parksville and Qualicum Beach.New Home warranty!